in another tenant who takes over the pad and The Monkees. Filmed At: Screen Gems Studio 6, Hollywood, CA. Written by Peter Meyerson and Bob Schlitt. �Sometime In The Morning� Written by Gerry Goffin & Carole King; Produced by Gerry Goffin, Carole King & Jeff Barry. The Monkees argue with their landlord Mr. Babbitt regarding their rent who the latter once again claims they're far behind in. Although they have a 7-day extension on their lease, he informs them that there's a new tenant arriving and they're out. The guys think he's just pulling their legs to scare until a middle-aged widow named Milly Rudnick arrives with suit cases, a parrot and a poodle, both stuffed, named Lewis and Myrton, respectively. To stop her from taking over their pad, the boys continuously protest Milly's presence, until she has them to stay on--as boarders! Then Larry the moving man shows up with Milly's furniture and before they know it, she sends the guys to work in helping him move her furniture in rapid time, leaving them exhausted on the floor. Later after settling down in the pad, Milly manages to bond with each of the guys in a maternal way, with Michael when's cleaning the kitchen. Then with Micky when he's fixing the car as she reminds and with David after the dinner as remembers about the people she knew in her old neighborhood. Later that day, Peter asks Milly about liking music and when she tells them that what they listen to isn't music, they try to convince her differently by performing for her �Sometime In The Morning� as she imagines herself a young woman waltzing with each of the guys in the pad dressed in tuxedos. The next day as the guys play with dominoes which represent Southeast Asia, Milly, a born matchmaker, meets Clarisse Rawlings at the supermarket and brings her home on s shopping cart for David. In a fantasy sequence, David repeatedly tries to discredit himself to her before finally declaring his love in which constantly replies "I don't care". Just then, Judy, Milly's sister, and her husband Arthur arrive with their four children, dressed as GIs and playing "army"; Micky tries to send them away declaring no more vacancies. Then the four kids manage to break the down with their toy bazookas and start causing havoc in the pad as they chase The Monkees all over the place, while Arthur and Judy greet Milly; one of their daughters already has Michael bound and gagged and forces him to talk. Soon Larry the moving man, a popcorn/peanut man offering his items of goodies, and an irate Mr. Babbitt all enter the fray, shocked at all the chaos. Afterwards, as everyone else goes out to the beach, The Monkees cannot join them, for they are all four bound and gagged by Judy's kids. After three days, Michael and David notice that Milly's influence has rubbed off on Micky and Peter, as they witness the former feeding chocolate pudding to the latter, and they decide that they have been conned. Everyone decides that this is definitely no life for them, or for Milly, and try to figure out a way for all five of them. Then they come up with an idea to marry Milly off; when Larry shows up again with a lamp her forgot, the boys realize they have their man. Later that night, Michael and David try prepare Larry for a date with Milly while Micky and Peter prepare Milly each tries to convince the other of the other's affection for him/her. Then Milly and Larry have a romantic candle light dinner on the balcony as Mike and Peter play romantic music for them. Milly nearly ruins the date by almost driving Larry away with an unending monologue about her late husband but in the end convince themselves they are in love; witnessed by The Monkees, they cheer in their success (but only in silence!). At the ensuing wedding, Milly offers a toast to her new husband and her matchmakers, The Monkees; Babbitt apologizes to the boys for any inconvenience, and Michael asks him to keep after Arthur and Judy's children and winds up being bound and gagged himself! The boys get their rent money playing for Milly's wedding, where they perform �Look Out (Here Comes Tomorrow)�. As Milly moves out, she expresses her pleasure of having lived under the same roof with The Monkees and they return the feelings. They think their troubles are over until she announces she has moved on the same block only two doors away and says she'll visit them often starting that night just as she calls for Larry who's moving all her furniture out with a not too pleasing look. �Monkee Mother� was Peter Meyerson's last collaboration with Robert Schlitt (the two of them having scripted The Monkees' series premiere, �The Royal Flush,� Episode No. 7, �The Monkees In A Ghost Town,� and the original story of No. 23, �Captain Crocodile�); he went on his own to compose 3 second-season Monkees episodes: Episode No. 39, "Hillbilly Honeymoon" (a.k.a. "Double Barrell Shotgun Wedding"), No. 48, "Fairy Tale", and 57, "The Monkees Blow Their Minds". Schlitt by the way took screen credit as Bob Schlitt for the first and only time; he continued to work in television for the next 35 years, with episodic writing credits that included The Nurses (ABC, 1965-67), NYPD (ABC, 1967-69), Adam-12 (ABC, 1968-75), Kung Fu (ABC, 1972-75) and Lou Grant (CBS, 1977-82), until his death in 2008. The Monkees were still on tour at the time of �Monkee Mother�'s production. An unused story idea from �Monkee Mother�'s entry in Screen Gems Storylines had The Monkees staging a contest in hopes of finding a suitable mate for Milly Rudnick. The normal budget for your standard, average episode of The Monkees ran about $350,000--$10,000 less than the budget for the 1969 Columbia release Easy Rider. Salaries for The Monkees were $450 a week; Screen Gems would increase it by $300 by the time production commenced for the second season. An August 28, 1967 repeat of �Monkee Mother� was the last official telecast of The Monkees television series for its first season on NBC. It was one of 2 episodes to be rerun in summer 1967 not to be redubbed with new music from The Monkees' 3rd and 4th singles and their 3rd album; the other was �The Son Of A Gypsy� (rerun June 12, 1967). �Monkee Mother� was one of 4 episodes of The Monkees to be dubbed from upgraded 1986 broadcast masters syndicated by Colex Enterprises for release in Rhino's 1995 Deluxe Limited Edition Boxed Set and 2003 DVD season sets of the show; others are No. 15, �Too Many Girls� (a.k.a. "Davy And Fern"), No. 45, "The Monkees In Texas", and No. 54, "The Monkees In Paris" (a.k.a. "The Paris Show"). Rhino searched high and low for 35mm interpositive masters to these segments in hopes of striking pristine new prints of them, but to no avail. 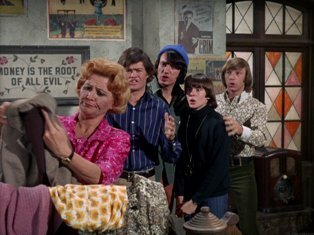 A fond farewell is bade to The Monkees' beauraucratic landlord, Mr. Babbitt, who makes his swansong apearance here. Henry Corden, who portrayed Babbitt, makes his only appearance in The Monkees' second season as Mr. Blauner in Episode No. 42, "The Wild Monkees." Also notice that Nesmith's wool hat has changed to light blue. In the scene where they serenade Milly and Larry with guitars during their candlelit dinner, Michael Nesmith and Peter Tork can be seen playing an instrumental version of the former's tune (and future inclusion on The Monkees' 4th LP, Pisces, Aquarius, Capricorn & Jones, Ltd.), "Don't Call On Me," similar to the early demo cut. Babbitt is wearing a suit and tie, glasses, and a mustache in this episode. In his previous appearances, he was usually clean-cut, wearing black trousers, a white shirt and a black vest. He also used to call The Monkees by their chrisitan names, but in this episode he calls them by their surnames. The tumbling dominoes of southeast Asia following the �Sometime In The Morning� number is a subtle reference to the Vietnam war. Two Monkees, Micky Dolenz and David Jones, managed to successfully sidestep Uncle Sam's call to serve in Vietnam; Dolenz for being to skinny, and Jones for being the main source of support for his family. Another reference to the war is made in Episode No. 49, "The Monkees Watch Their Feet". The Monkees will be seen working their matchmaking magic once more in Episode No. 39, "Hillbilly Honeymoon" (a.k.a. "Double Barrell Shotgun Wedding"). The Monkees' pad will once again be besieged by unwanted tenants in Episode No. 36, "Monkee Mayor". David can be seen wearing his yellow shirt again, the same one he wore in Episode No. 13, �One Man Shy� (a.k.a. "Peter And The Debutante"), and No. 15, �Too Many Girls� (a.k.a. "Davy And Fern"), and will wear in No. 49, "The Monkees Watch Their Feet". Also note in this and several other Monkees episodes that only David and Micky are wearing rings; David wears one, on his left ring finger, and Micky wears two, one on his left ring finger and the other on his right pinky. Michael says he comes from a big family...consisting of just his mother Bette and himself. This episode aired one day after Ursula Andress' 31st birthday. David Jones makes a specific reference to Andress in the interview segment of �The Monkees In Manhattan� (a.k.a �The Monkees Manhattan Style�). Here, Micky is seen fixing The Monkeemobile; ironically, 26 episodes later, in No. 53, "The Monkees Race Again" (a.k.a. "Leave The Driving To Us"), he will be seen as an inexperienced mechanic! Clarisse Rawlings wears the same orange outfit Toby Willis (Valerie Kairys) did in Episode No. 24, �Monkees A La Mode�. Henry Corden (Babbitt) was previously seen with Oscar Beregi (�The Prince And The Paupers�) and Olan Soule (�The Monkees In Manhattan� [a.k.a �The Monkees Manhattan Style�]) in the April 2, 1960 episode of Have Gun Will Travel (CBS, 1957-63), "International Affair." Actor Alfred Dennis, who portrays Arthur here (under the shorter name Al Dennis), reappears on The Monkees as Dr. Correll in Episode No. 30, �The Monkees In Manhattan.� He later on played parts in a couple of episodes of The Rockford Files (NBC, 1974-80), which starred Monkee guest alum Stuart Margolin ("The Monkees Watch Their Feet"), and became known for his role of Miller on Life Goes On (ABC, 1989-93). The late William Bramley (Larry) played Dr. Bernard Krantz in two episodes of the TV series Dr. Kildare (NBC, 1961-66), but is best remembered for his role as Officer Krupke in the 1961 film version of West Side Story. Trekkies recognize him in his role as a policeman in the March 15, 1968 episode of Star Trek (NBC, 1966-69), "Bread And Circuses". Bramley previously appeared with pre-Monkee guest Reginald Gardiner ("The Monkees Mind Their Manor") in a February 18, 1965 episode of Hazel (NBC/CBS, 1961-66), "Stop Rockin' Our Reception." Judy March (Judy) would later turn up in 2 episodes of Bewitched (ABC, 1964-72) with guest alumni from The Monkees: the February 27, 1969 episode "Going Ape," with Lou Antonio ("Hillbilly Honeymoon" [a.k.a. "Double Barrell Shotgun Wedding"]), and the October 30, 1969 episode "To Trick-or-Treat or Not to Trick-or-Treat," with Jeannie Sorel ("The Monkees Christmas Show"). Alexandra Hay (Clarisse) was later featured in the September 28, 1969 episode of Mission: Impossible (CBS, 1966-73), "The Code," with Monkee guest alumni Nare Esformes ("It's A Nice Place To Visit...") and Art Lewis (�Find The Monkees� [a.k.a. "The Audition"], "The Picture Frame" [a.k.a. "The Bank Robbery"]), and seen in the 1969 Columbia picture Model Shop, with another Monkee guest, Severn Darden (�Monkee Versus Machine�, "The Monkee's Paw").